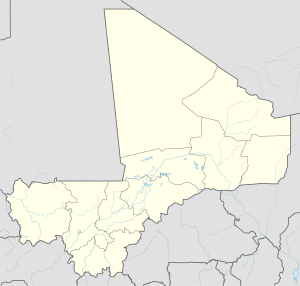 Aguelhok or Adjelhoc (the official name) is a rural commune and village in the Kidal Region of eastern Mali in the Tessalit Cercle. In the census of 2009 the commune had a population of 8,080. Adjelhoc is situated in the north of the Tilemsi Valley. Located in the sandstone massif of the Adrar des Ifoghas, Adjelhoc lies 430 km north of Gao and 150 km south of the Algerian border, in open desert. The area of the commune is approximately 22,000 km2, that is to say the equivalent of Belize. The population is 95% Tuareg. The majority have a nomadic lifestyle. In January 2012, the Islamist group Ansar Dine captured a military base at Aguelhok from Malian government forces. France accused the group of summarily executing 82 soldiers and following the capture, describing the group's tactics as "Al-Qaeda-style". In all 128-153 soldiers were killed. On 29 July 2012, Islamists stoned a couple to death for having children outside of marriage. An official reported that many people left the town for Algeria following the incident. ^ a b Resultats Provisoires RGPH 2009 (Région de Kidal) (PDF) (in French), République de Mali: Institut National de la Statistique, archived from the original (PDF) on 2011-07-22 . ^ Plan de Securite Alimentaire Commune Rurale de Adjelhoc 2007-2011 (PDF) (in French), Commissariat à la Sécurité Alimentaire, République du Mali, USAID-Mali, 2007, archived from the original (PDF) on 2012-06-11 . ^ a b Agence France-Presse (21 March 2012). "Islamist fighters call for Sharia law in Mali". Archived from the original on March 22, 2012. Retrieved 25 March 2012. ^ Adam Nossiter (30 July 2012). "Islamists in North Mali Stone Couple to Death". The New York Times. Retrieved 30 July 2012.